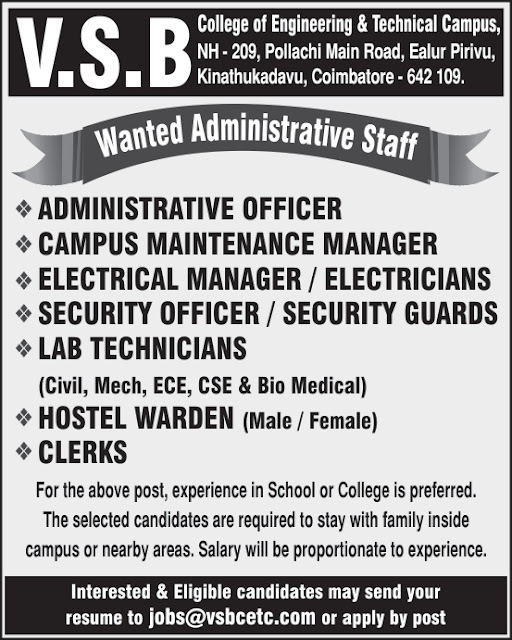 VSB College of Engineering, Coimbatore has advertised for recruitment of Non-Teaching Faculty jobs vacancies. Interested and eligible job aspirants are requested to apply within 10 days from 27th January 2019. Check out further more details below. About College: VSB College of Engineering Technical Campus was established by V.S.B. Educational Trust in the year 2012. Self-financing co-educational institution with an objective to afford value-based technical education and mould the students for industry requirements. The College is one of the most sought after colleges in the central part of Tamil Nadu for its academic performance and placement records. Administrative Officer- Any degree with experience in School or College is preferred. Campus Maintenance Manager- Any degree with experience in School or College is preferred. Electrical Manger / Electricians- Any degree with experience in School or College is preferred. Note: The selected candidates are required to stay with family inside campus or nearby areas. Salary will be proportionate to experience. How to Apply: Interested candidates are requested to send their resume along with recent passport size photograph and necessary documents to THE SECRETARY by Post or Email address within 7 days from the date advt.